In delicate contrast to the vivid hues of our other spring flowering trees, the Pink Cassias, with their lovely cool shades of pinks, greens and white, are a beautiful and restful sight. No one could fail to be moved by the glory of a Cassia in full bloom when its long, sweeping branches are laden with blossom. Each of the five varieties has its own individual, almost indescribable charm. At a glance it is difficult to distinguish one from another but a little study reveals numerous characteristics. They quickly became popular and are now common in gardens and on roadsides. Few of them have names in any vernacular. The first to bloom is the Horse Cassia (C. grandis). In the winter all the leaves fall and in March or April, from the axils of the old leaves rise fine sprays of bright-pink flowers, shading to pale peach and coral according to the amount of sunlight received. The flower branchlets spring rather stiffly from either side of the main stem giving a different appearance to the softly drooping sprays of the other Cassias. There are no bracts at the bases of the flower stalks. The leaves are pinnate and bear from ten to twenty small, oval leaflets, rounded at the ends. When young they are soft and downy and the end leaflets have a distinctive wash of bronze. The fruit is a wrinkled 3-inch pod, smooth and cylindrical. The Red Cassia (C. marginata) known as Vakai and Kirudam in Tamil and Samarela in Telegu, is smaller and less robust than the other varieties, but is extremely beautiful at all times of the year. The name refers to the thickened margins of the leaves. In May and June, the upper surfaces of the downward sweeping, hairy branches are laden with copious, short clusters of deep pink flowers. The tree appears almost overweighted with the profusion of blossoms. The flowers are quite small, little more than 1 inch across, with five petals, two of which are often slightly larger. The calyx is pink and the nine stamens are in three groups; three are very long and curved, the next four are less than half that length and all bear red anthers. The remaining two are very short and have yellow anthers. The flowers are more of a salmon-pink than the other Cassias and each petal is delicately veined with green, the pink becoming deeper as the flower ages. The bracts at the bases of the flower stalks are palegreen and the calices pink. Each leaf bears from five to ten pairs of small leaflets, oblong and blunt ended. The pods are slender 10-inch cylinders. 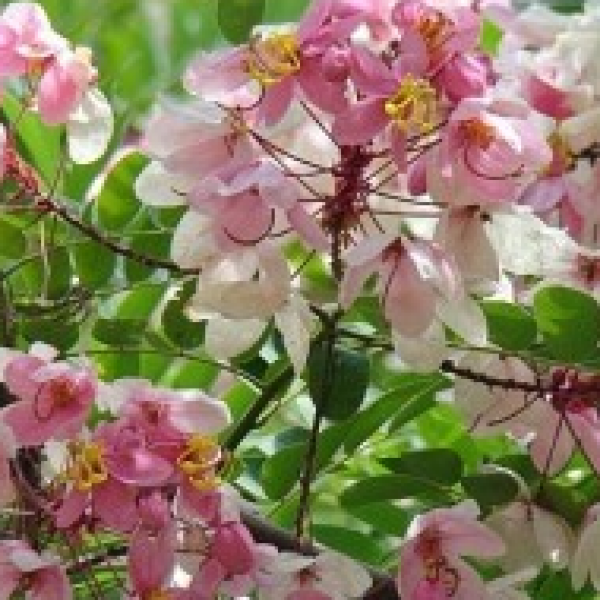 The Burmese Pink Cassia (C. renigera) is thus named because of the kidney-shaped appendages from which spring the leaf stalks. It is a small tree - not more than 20 feet but in May when the large, showy flowers and tender, green leaves appear, it presents a strikingly beautiful picture, enhanced by the varied tones of pink in each dense cluster. These clusters rise on short stems from the scars of the old leaves. At the base of each flower stalk is a bract like a small leaf and these numerous bracts crowded together form a long clump from which spring the downy, red stalks. Outside, the calyx is dull red; inside, the palest green. The flowers, each about 2 inches across are a deep pink when young, but fade almost to white. The ten yellow stamens are in groups of three, four and three, crowned with delicate green anthers. The longest three are curled like the letters "S" and have a curious balloon-like swelling in the middle. The leaves, which fall in December, leaving the tree adorned only by the long blackened pods, are up to 1 foot in length. Each bears from eight to twenty pairs of downy oblong leaflets, rounded at the tips. Cassia nodosa. The name alludes to the node, or swelling in the longest stamens, but as other species also have this characteristic the name is rather misleading. It is a larger tree with a fine, spreading crown. In May the flowers appear in groups along the downy branches, each cluster borne on a short stalk. The flower stems are red and grow in whorls. The buds and flowers are deep pink, fading to white and each petal is somewhat pointed at the tip. The calyx is green and velvety and the bracts narrow ovals. There are ten yellow stamens, the longest three having a round swelling in the middle. The pods grow as long as 18 feet and are an unattractive feature of the tree. A leaf may be from 6 to 12 inches long and comprise up to thirteen pairs of leaflets. These are pointed at the apex, leathery and slightly glossy.